I don’t know that explaining what quinoa is made this dish any more appetizing to my little foodies, but looking up the details certainly educated me. 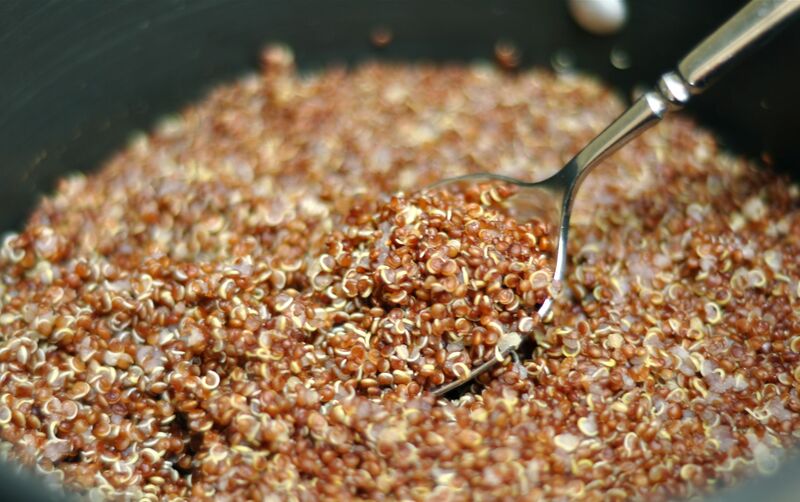 Quinoa is actually a seed and is related to “beets, spinach and tumbleweed.” Pretty sure that last one won’t be used in any marketing materials. But this seed seems to be a super food because it’s packed with protein, amino acids and fiber (thank you Wikipedia). And I love the texture, which is like a softened grainy crunch. 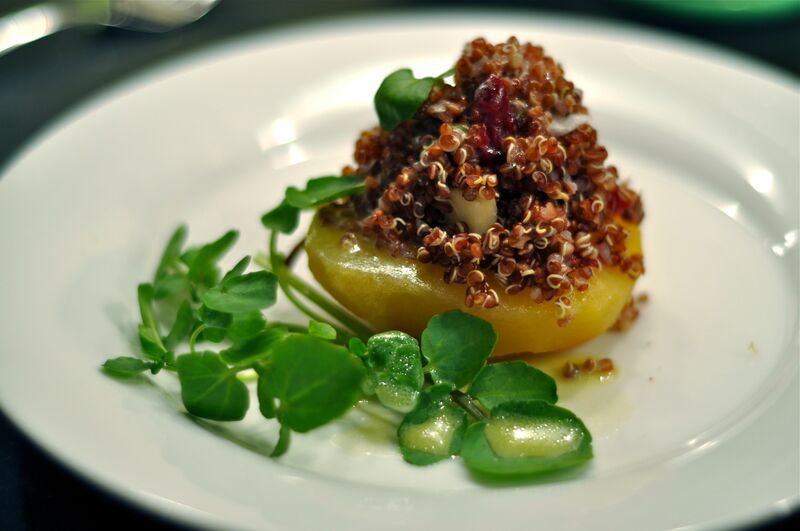 In a tiny local tapas place, this is the dish that inspired me: Red Quinoa and Poached Apple with Lemon-Herb Vinaigrette. You know how sometimes you can taste a meal by just reading a recipe? That was my experience with this small plate. The contrasting textures of the soft apple and crunchy quinoa mixed with a smooth yet tart dressing captured my imagination as I read it on the menu. And the real thing didn’t disappoint, except for the fact I had to share it with three others. Starting with only the memory of my taste buds, here’s a close re-creation of the dish. It wasn’t an exact replica, but good enough to elicit thumbs up from my taste-tasting guests. Place cider and apples (cut-side down) in shallow baking dish. Cover tightly with foil. Cook for 20 – 25 minutes until fork tender. Uncover, drain, and set aside to cool. Add quinoa and water, along with dash of salt and pepper, to a pot and simmer according to package directions (my package said bring to a boil then simmer for 15 minutes). 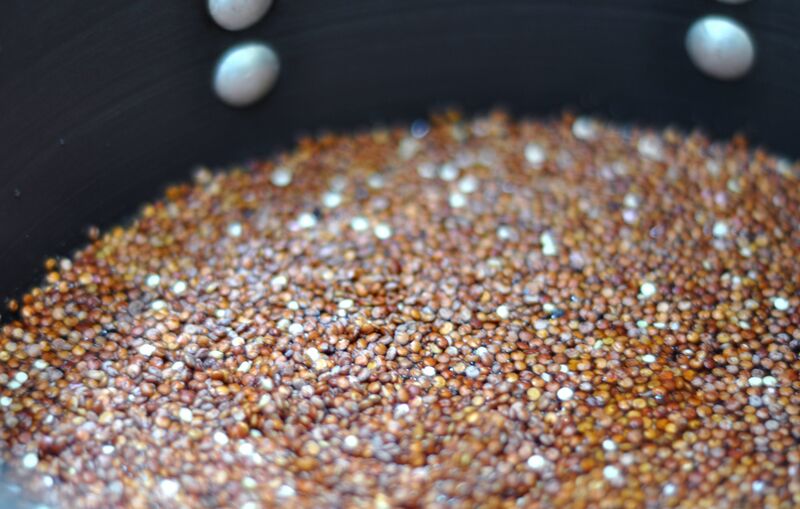 When cooked, transfer quinoa to a large bowl and let cool. Make the vinaigrette (see recipe link). Mix in diced apple, dried fruit, and red onion. Season with salt and pepper. I have been waiting for this post……thank you! For the rest of you, I can attest to the deliciousness of this! Sounds like another winner. 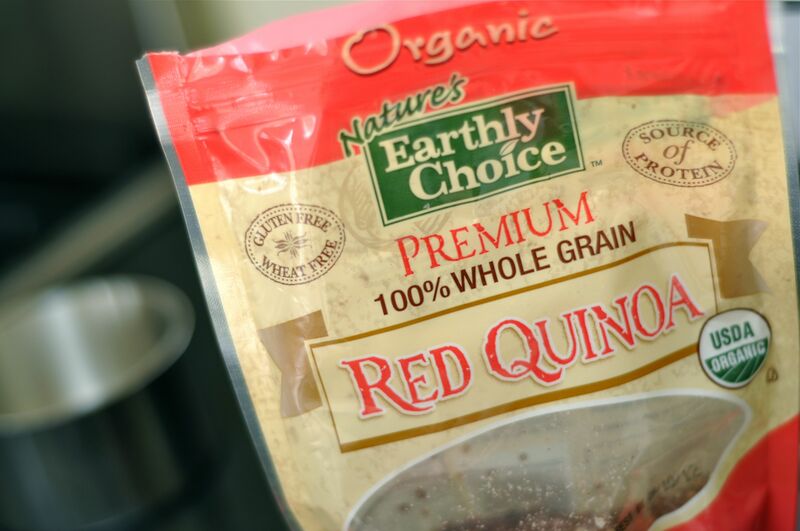 I didn’t know quinoa “came in red” too. Have only experienced the natural looking color…but love that with lots of lemon. Will give this one a try. Thanks.